Firstly, the parasite flora of our horses have changed over time due to our deworming protocol and strategies that we have been implementing in the past. Rotational deworming regimes that were once recommended were implemented 40 years ago when large strongyles were the most important parasite pathogen of horses, and based on their life cycles, it was an effective deworming strategy. This strategy has been so successful that we have now managed to change the parasite flora of the horses gut and now small strongyles are considered the most important parasite pathogen of horses. Secondly, due to our frequent deworming regimes over the last few decades we have selected for high levels of resistance in the small strongyles and Ascarids populations. Both these changes highlight that our current deworming approach is not sustainable and the need for new strategic deworming regimes with our horses needs to be implemented. As said before, small strongyles have become the most important parasite in our horses, they are found everywhere and all our grazing horse are infected. For part of their lifecycle they encyst in the gut lumen, this is important as these encysted larvae cannot be detected by faecal egg count tests and can suddenly all emerge at the same time (condition called Larval Cyathostomiasis), trigger is unknown but could be due to things such as seasonality or deworming, and can lead to irritation of mucosal lining of cecum and colon, impaired gut motility, sudden diarrhea, weakness, muscular wasting, severe colic and can result in death. Moxidectin is not only is a broad spectrum, potent dewormer but also does encysted small strongyles without producing signs of inflammation. The goal of deworming is not to eradicate all the parasites in a horse, but rather to manage the parasite load so the horse remains healthy and illness doesn’t develop. If you try to eradicate all the worms in an individual horse you will ultimately just accelerate the development of resistance to dewormers. One or two yearly treatments with a broad spectrum dewormer at strategic times of the year during times of peak transmission (spring and autumn). One of these treatments should include a dewormer effective against encysted strongyles at a time of the year where mucosal burden are at its highest. This time is most likely to occur at the end of the grazing season, spring time. All further treatments in between the treatments mentioned above should be a targeted approach of identifying and treating high shedders through Feacal Egg Count procedures. Individual horses have different potential for egg shedding, therefore you need to identify these high egg shedders and deworm them as needed. Money spent on proper diagnosis leads to less money spent on dewormers, less drug resistance, and better control of worms. *These recommendations are for a mature horse, and are just guidelines, and an overall strategy for your specific stable yard should be implemented under the guidance of your veterinarian. A “selective” deworming program will result in fewer treatments given, which leads to less drug resistance developing, and if done properly will still result in better overall parasite control7. 7.Nielsen M.K. et al. 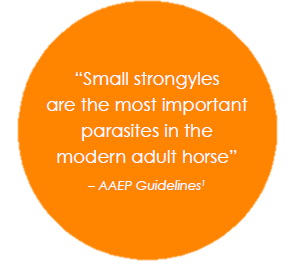 AAEP Parasite Control Guidelines. AAEP Parasite Control Subcommittee. 2013; 1-24. 10.Betancourt A., et al. Characterisation of the inflammatory cytokine response to anthelmintic treatment in ponies. Equine Veterinary Journal. 2014; 1-5. 12.Steinbach T., Bauer C., et al. Small strongyle infection: Consequences of larvicidal treatment of horses with fenbendazole and moxidectin. Veterinary Parasitology. 2006; 139:115-131. 14.Reid S.W., Mair T.S., Hillyer M.H., Love S. Epidemiological risk factors associated with a diagnosis of clinical cyathostomiasis in the horse. Equine Veterinary Journal. 1995; 27:127-130.